550 Italian prisoners of war, captured in North Africa during World War II, were brought to Orkney in 1942. They worked on the construction of the Churchill Barriers, four causeways created to block access to Scapa Flow. 200 were based at Camp 60 on Lamb Holm. In 1943, Major Thomas Pyres Buckland, Camp 60's new commandant, and Father Gioacchino Giacobazzi, the Camp's priest, agreed that a place of worship was required. 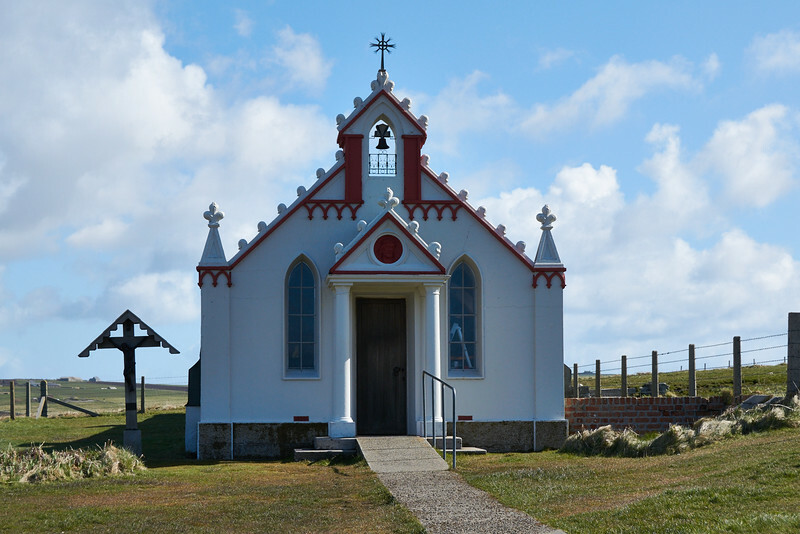 The chapel was constructed from limited materials by the prisoners. Two Nissen huts were joined end-to-end. The corrugated interior was then covered with plasterboard and the altar and altar rail were constructed from concrete left over from work on the barriers. The prisoners created a facade out of concrete, concealing the shape of the hut and making the building look like a church. The light holders were made out of corned beef tins. The baptismal font was made from the inside of a car exhaust covered in a layer of concrete. (Thanks are due to Wikipedia for the above details).